The best way to process beeswax is actually quite simple. This whole process takes around 30-45 minutes and then another few hours for the wax to cool depending on the quantity this may take several hours. This is a one step filtering process so there is no need to melt the wax down and filter it more than once. Step 1: Lay a large piece of cheesecloth on a flat surface. Place the honeycomb in the center of the ultra fine cheesecloth. It doesn’t matter if there is debris like dead bees mixed in with the honeycomb since the beeswax will be filtered out. Wrap the cheesecloth around the honeycomb forming a bundle with all ends of the cheesecloth gathered snugly in your hand. Using your tying material, secure all the ends of the cheesecloth together. Make sure the ends of the cheesecloth are tied tight so no debris leaks out into the filtered beeswax. Step 2: Fill the pan with water and place it on the stove. Place the cheesecloth bundle in the water. Turn the stove on to a medium/low heat. As the water heats, the beeswax honeycomb with start to melt and seep out of the cheesecloth leaving the debris on the inside of the cheesecloth. As the beeswax starts to melt, you will see the yellow liquid wax floating in the water. Step 3: Once most of the wax appears to have melted out of the cheesecloth bundle, you can use a pair of tongs to squeeze the small bundle left. This will help extract the last of the beeswax from the bundle. Step 4: Remove the cheesecloth from the pot of melted beeswax and water. Allow the pan and contents to cool, which can take a few hours. The beeswax will form a layer on top of the water when it is melted. As it cools, it will form a solid layer of beeswax on top of the water. Step 5: After the beeswax cools and hardens on top of the water, gently push down the edges of the beeswax. It will separate from the pan. 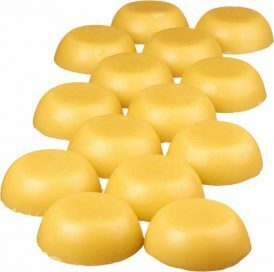 Remove the solid round of beeswax from the pan. Place the beeswax on a cloth towel on the counter to dry out. When rendering beeswax from brood comb….. When processing beeswax that has a little brood comb or large amounts of debris, double or even triple the layers of cheesecloth from the start! Previous Previous post: What Is Organic Honey Certification?